It was a Friday night, and each of the college students—three seniors and two sophomores—already had plans for the evening. Yet, one by one, they canceled those plans, grabbed dinner and headed back to a computer lab on campus. And they got to work, from 5 p.m. on Friday to 6 a.m. on Saturday morning. They weren’t cramming for a test or trying to finish a group project before the deadline. They were writing an opera. The opera, Requiem for the Living: An Opera, was conceived, written, composed and staged entirely by Trevecca students. In April, they’ll perform the opera, twice on Trevecca’s campus and once at Nashville’s Noah Liff Opera Center. The teamwork necessary to make the opera a reality extends far beyond midnight snacks and encouraging texts. According to Dr. Eric Wilson, chair of Trevecca’s music department, the opera was a team project from day one. The idea began as a Faculty-led Academic Research Experience (FLARE) project. Wilson, who wrote the initial proposal, designed it as an interdisciplinary and interdepartmental experience. Once the composers completed the libretto, the production team took over. They held auditions, cast the main roles and began rehearsals. 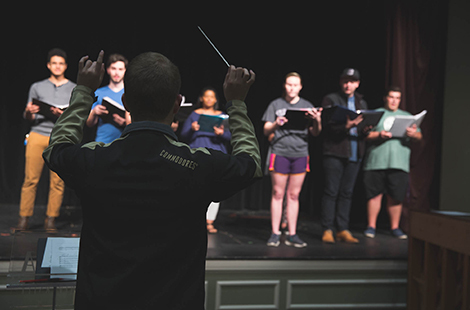 Trevecca student Ingrid Rekedal is directing the opera, and Dr. Jeff Frame, professor of dramatic arts and communication, has been a helpful resource to the students as they plan to stage and perform the work. Wilson’s initial proposal was for a one-act opera, maybe 30-35 minutes long. But Trevecca students have crafted something much more elaborate and sophisticated than he ever thought possible. The story follows a year in the life of four friends as they grieve over the death of another friend, Louise. Redemption and grace are significant themes, woven throughout the work. For commercial music senior Christopher Rush, another of the opera’s composers, the prospect of seeing something he had a role in creating come to life is thrilling. Rush will play James in the opera, one of the five main characters whose deep grief creates isolation and conflict among the friends. Wilson says few universities are able to offer this kind of experience to their students. Cheever, who also serves as the opera’s music director and conductor, agreed. “I don’t know of any other undergrad music major walking out with an opera under their belt,” he said. For more information about the opera, follow the project on Facebook.